Sheet masks and their textures – what's the right mask for you? Face masks are a great call to hydrate skin, draw out excess oils, reduce skin inflammation, detoxify, etc. However, they come in a few different fabrics and types, something you should know to choose the best mask for your skin type. Hydro-gel masks offer better performance than low-end fiber and pulp masks. In these, cosmetic serum and gelatin blends together to give the mask the feel of a cool, thin film layer. Hydro-gel masks require careful handling because the fabric is rather thin and prone to tearing. Skin Republic Collagen Hydrogel (AED33) This super-hydrating hydrogel serum sheet mask instantly restores moisture, elasticity and a healthy glow to skin. Nutrient packed Sea Minerals nourish and hydrate. Collagen and Argan Oil help reduce the visible signs of ageing. Skin appears smooth, plump and more youthful. Bio cellulose masks, an all-natural fiber, is considered the gold standard for hydrating and treating skin. Bio cellulose mask fabrics provide skin-tight dermal adhesion, allowing them to transfer cosmetic ingredients very efficiently. The texture of a bio cellulose mask feels like a cool, moist gel, but the underlying structure is strong and resilient. This one could be your No.1 choice. Skin Republic Stem Cell Plant Protein (AED 27) This mask regenerates and revitalizes the skin by smoothing away the appearance of fine lines and deep wrinkles with Stem Cell Plant Protein. CoQ10 helps rejuvenate the skin and reduce the signs of ageing for vibrant, younger looking skin. Foil Sheet Masks prevent evaporation, so for those who wish to enjoy the benefits of a refreshing facemask for longer periods should use foil sheet masks, because they keep it all in. These facemasks use foil on the outside of the sheet mask to prevent the liquid and skin-benefitting ingredients from evaporating, keeping them moist the entire duration of your session. Skin Republic Youthfoil (AED 40) Age-defying foil sheet mask delivers a one-way surge of youth activating concentrate. Immersing skin in a double dose of Hyaluronic Acid, this high-performance foil backed sheet mask locks in moisture for nourished, younger and more luminous looking skin. 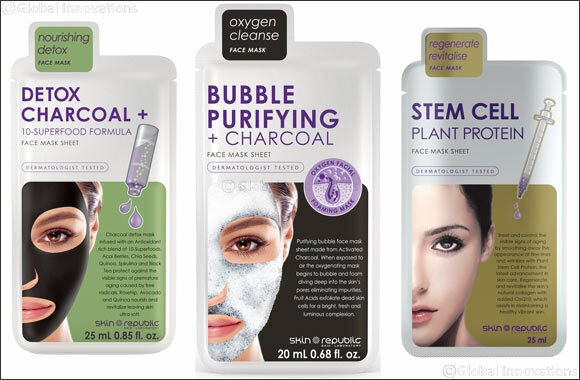 Clay and charcoal sheet masks are black in color, enriched with clay or charcoal. These masks are usually super-saturated and feel very smooth on the skin because they contain micro-particles of important detoxifying ingredients. These masks are suitable for oily skin to combination skin. Clay and charcoal absorb excess oil from skin’s surface, and it has the ability to gently draw out dirt from congested pores. Skin Republic Detox Charcoal + (AED 32) Charcoal detox mask infused with a 10-superfood complex, rich in antioxidants. This mask helps prevent premature ageing from free radicals and protects the skin against environmental pollutants. The infusion of charcoal helps to draw out impurities and detoxify the skin for a more healthy, luminous complexion. Bubbling Sheet Masks: These are also usually made with charcoal and detoxifying ingredients. They contain some foaming ingredients like those found in cleansers, and the bubbles form a foam on top of the sheet mask, which you can use to massage your skin after you have removed the sheet mask for soft, moisturized skin afterwards. Skin Republic Bubble Purifying Mask (AED 30) The purifying bubble face mask sheet is made from Activated Charcoal. When exposed to air, the oxygenating mask begins to bubble and foam diving deep into the skin’s pores eliminating impurities. Fruit Acids exfoliate dead skin cells for a bright, fresh and luminous complexion.